HIGH QUALITY, HIGH PERFORMANCE! 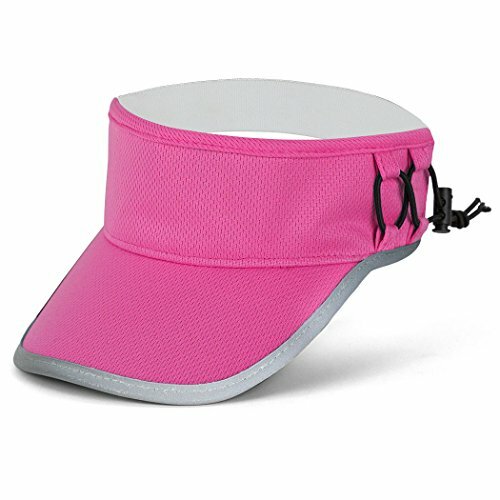 Our ultralight pink visor is great for all sports including: running, hiking, golfing, playing tennis, or even just relaxing. The RunTechnology terry sweatband along helps keep the sweat out of your face as well as shield your eyes from harmful UV rays or constant driving rain. COMFORT! The Gone For a Run Outdoor Sports Visor with RunTechnology provides extreme comfort as well as ventilation. The moisture wicking performance polyester, the terry sweatband and the elastic backing allow for the visor to remain perfectly positioned throughout any athletic activity. No more irritating velcro getting stuck to your hair. THE MULTI-FUNCTIONAL BUNGEE SYSTEM is easily adjusted to keep your belongings safe during the run. The removable bungee can hold items such as: keys, money, gel packs, sports performance bars, flashlights and other essentials that may be too bulky to keep in your pockets. No need to worry about items bouncing around in your pockets while exercising. REFLECTIVE PIPING! Do not be afraid to run in the dark anymore. The reflective piping along the edges of all six fashionable colors allow you to run at any time of the day, whether you are up early in the morning or well into the evening. DESIGNED AND SOLD BY GONE FOR A RUN - A USA based, family owned and operated business located in Connecticut. We pride ourselves on the integrity and quality of our products and firmly stand behind all that we sell. If you are not 100% satisfied with your purchase, please contact us so we can make it right. If you have any questions about this product by Gone For a Run, contact us by completing and submitting the form below. If you are looking for a specif part number, please include it with your message.